Gauge Roberts is a young man who has lived on the margins and is now on his way to breaking his own particular cycle of poverty. 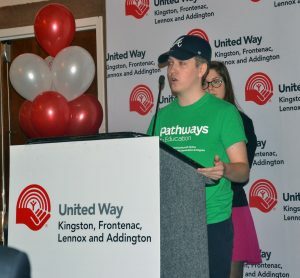 Roberts, 19, spoke at the United Way of Kingston, Frontenac, Lennox and Addington Touchdown Breakfast at the Ambassador Hotel and Conference Centre on Thursday morning. At the breakfast it was announced that the local United Way had reached a fundraising total of $3.564 million for area social agencies and other community initiatives. Roberts was able to use the services of one of those agencies, Pathways to Education, to rise from the poverty of his youth. In a short speech to about 500 local United Way volunteers, Roberts said he grew up in poverty with his sister and an ex-convict single father who wasn’t able to help him with his education goals. But he got connected with Pathways and hasn’t looked back. “From high school, I was put into a program for four years,” he said. As well as using the education programs offered, he attended youth conferences in Winnipeg and in Toronto last summer, where he got to meet former U.S. president Barack Obama. He’s now at St. Lawrence College, enrolled in the first year of the two-year social service worker diploma program, and working part time for Pathways. Roberts said that after his father got out of prison, he got sole custody of Gauge and his sister. But there wasn’t much money to go around.